Enjoy learning for its own sake – education can sometimes seem like an endless series of hoops to jump through, without much time to experience the simple joy of indulging your curiosity and following your interests wherever they take you. Our classes are active, collaborative, and, like university seminars, they offer opportunities to approach questions in your own way. Find out how far you can go – try some very challenging material (undergraduate level for older students), and see just how far you can go with expert coaching and encouragement. This is a chance to really stretch yourself, and to discover what you can really do. Make lasting friendships – meet positive and enthusiastic people who share your intellectual interests, and forge friendships which often last into university and beyond. Learn from the best – typically studying for postgraduate or doctoral degrees from top universities, our tutors offer deep subject knowledge, while still being relatable to school age students. As well as being experts in their fields, Debate Chamber tutors are carefully selected for their exceptional communication skills and passion for teaching. Be inspired – discover a world of new ideas, thinkers and books, and get lots of tips and advice on how to develop your new passions. Hear new perspectives – debating and discussing issues with people from a wide range of backgrounds and points of view will broaden your outlook and sharpen your thinking skills. Our small class sizes and group activities give plenty of chances for you to be heard and to listen to others. Keep your brain active – don’t let your academic skills lose their edge over the long summer break! Make better decisions about your future – deciding what to study at uni, especially if you are considering a subject not offered at school, can be very difficult. Getting a realistic taste of undergraduate material in your chosen subject will help you to make a much more informed choice. Broaden your understanding – the exam curriculum often shows only a small slice of what a subject has to offer, attending a summer school will open your eyes to the full range of possibilities. 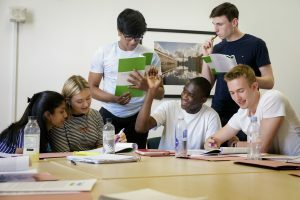 Bring ideas to life – as well as traditional university style seminars and close reading exercises, we also engage in lots of group activities which offer the opportunity to use your knowledge in practice – mock trials, parliamentary debates, United Nations sessions, economic negotiations, historical research, medical ethical panels and more.